Drawing you closer to maritime collections. On Tuesday 22nd August, Sea History Differently hosted its first event in collaboration with the Crafting History project. The day was a celebration for the recent conservation work that has been going on and is reaching completion, but also to recognise and showcase our fantastic maritime collections. Wood carver, Jill Brewster, who earlier this year was selected as one of the artists for the Crafting History project returned for the day to showcase her skills whilst creating something new for the project. 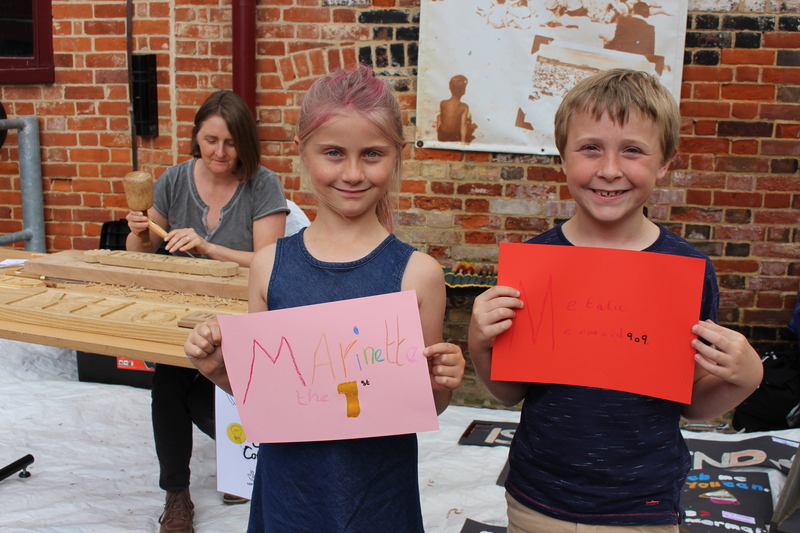 She was working on some wooden boat name plaques, inspired by our collections, which will be used as part of our exhibition next summer. Each type of wood is different and an example of the sorts that would have been used by ship and boat builders in Great Yarmouth when building boats such as those in our collection. Jill, Kelvin and Dave were tasked with selecting a winner, and in the end decided that as the exhibition will be community co-curated, it only made sense to have a joint winning effort. So the two favourites; Mollie’s Mermaid was merged with The Merry Weather to make….. Merry Mermaid. Congratulations to Molly & Rose who came up with the names. Kelvin and Dave were on hand to answer questions from visitors and to show ‘live conservation’ as it happens in a museum. Shipmates underwent a final round of paint removal, whilst the Coronation saw a final coat of paint on her hull. Morris and Mauro had a selection of ship models on display; a treat for visitors as normally they are kept in store. It was a great opportunity to highlight and show a part of our collection that normally remains locked away, also to prove that museums have much more than just that on display. Morris also gave a masterclass in rope knotting! The day saw over 150 visitors pass through and engage with our event and we hope they all enjoyed discovering all things maritime! A great example of how working in collaboration can promote the work and collections of museums with public in a fun, creative and interactive way. Check out the slideshow at the top of the page for all of the day’s photos.